There's so much awesome stuff on the way for FREE COMIC BOOK DAY this year, Third Eye Faithful, with big releases from all the publishers hitting, including the start of one of the biggest things to hit comics in 2019: Donny Cates's huge upcoming CARNAGE crossover event, which looks to take the heat he's been steady building on VENOM and rocket it to the next level! In addition, DC kicks off its huge YEAR OF VILLAINS theme which will be running throughout 2019, and delivering some of the biggest moments in the DC Universe that we've seen since REBIRTH began! PLUS: there's a TON of other great free comics hitting this year, including the kick off to SAVAGE AVENGERS, a special edition re-issue of SPAWN #1 from IMAGE, a brand new one-shot DEADLY CLASS story from IMAGE, and so much more! 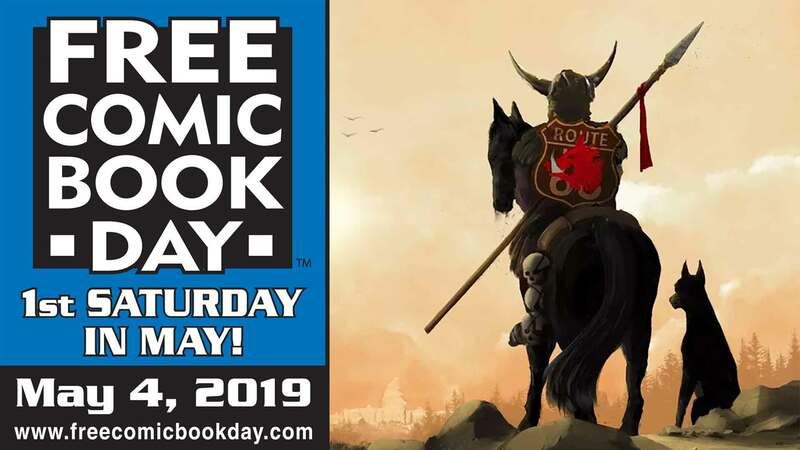 This year is a very special year for FCBD as the line-up is not led by just one book in particular, but instead, there's several amazing top shelf reads that we cannot wait to get our hands on. Seriously: every year, the FREE COMICS get better, and better - and this year may be the best selection yet! Third Eye Faithful, one of our all-time favorite creators in comics has gotta be Skottie Young, who's unique talent for both writing and illustrating some of the most entertaining, and immersive comic book worlds, has had us hooked and consistently impressed for years! As huge fans of Skottie's work on I HATE FAIRYLAND and BULLY WARS, we knew we were going to be excited about his IMAGE COMICS series, MIDDLEWEST, which may be our favorite thing by SKOTTIE yet! In MIDDLEWEST, Skottie & the incredibly talented Jorge Corona are building an epic modern-fantasy read that's on par with some of the best darn comics we've read, and brings us strong memories of the golden age of DC's VERTIGO imprint (series like FABLES, JOE THE BARBARIAN, THE SANDMAN, and more), and we're so stoked to see it arriving in trade paperback! May 19, 2019: Thanos #1 Launch Signing w/ Tini Howard! Third Eye Faithful, you know that we love hosting amazing creators and that you all have the best time with these events! We're so stoked to be able to bring you another signing, this time with THANOS writer TINI HOWARD! Thanos may very well be one of the most divisive figures in the entire Marvel Universe, but one thing is for sure – we can't get enough of the Mad Titan! Tini Howard has done some great work on some of our other favorites, and we're stoked to get our hands on the start of this awesome new THANOS mini-series! Okay, Third Eye Faithful, you know us, we absolutely LOVE us some X-Men, and we know a lot of you do, too! Believe us when we tell you that AGE OF X-MAN is going to be HUGE. It's one of the biggest cross-over events in a minute and is going to feature a ton of your favorite mutants! It all comes to a close with this final issue (which is why we're telling you so early! You're going to wanna get in on this before the end!) and it promises to be a true epic! Writers LONNIE NADLER and ZAC THOMPSON are a killer team that have worked together on a ton of other projects and now they're putting their creative genius together to bring you an X-Men story that will undoubtedly resonate with X-Men fans. Mark your calendars for this one, Third Eye Faithful, you're not going to want to miss it! Join us on July 17th 2019 from 6pm-8pm at Third Eye Annapolis for a truly out of this world signing! April 5, 2019: Thank God It's Shazam Day at Third Eye! We are so darn stoked for the SHAZAM movie, it's ridiculous, and we know that you are too, Third Eye Faithful! In anticipation of the awesomeness that is the SHAZAM flick, we've put together a killer celebration for 4/5/19 (aka the day the movie comes out!) to help you get totally pumped for SHAZAM! Read on below, and get the full scoop on all the cool stuff we've got going on including a FREE DC comic featuring great starting points for all your favorite DCU Icons! GET A FREE COPY OF A DC COMIC FEATURING STARTING POINTS FOR ALL YOUR FAVORITE DCU ICONS! All you have to do is pop by anytime between 11AM-9PM (8PM at St. Marys and Richmond!) at any Third Eye location, and we'll get you hooked up! GET A SHAZAM FUN-PACK FEATURING 2 DC COMICS WITH THE PURCHASE OF ANY SHAZAM GRAPHIC NOVEL, TOY, STATUE OR T-SHIRT! You love free stuff, right? And, we love giving you free stuff - so, we couldn't help but add a little extra-something awesome with our SHAZAM FUN-PACK featuring 2 FREE DC Comics (and maybe a surprise or two) when you purchase any SHAZAM graphic novel, toy, t-shirt or statue! BE ENTERED TO WIN A SHAZAM PRIZE PACKAGE WHEN YOU COME IN SHAZAM COSPLAY! And, hey, just for coming to see us on Friday 4/5/19, we'll even toss in something extra for you: a raffle ticket to be entered to win a SHAZAM prize package featuring tons of cool goodies -- but you have to be Cosplaying as a character from Shazam or Shazam himself! BE THE FIRST TO READ THE BIGGEST THING TO HIT MARVEL SINCE SECRET WARS! - GET THE EXCLUSIVE War of the Realms Issue One Party Variant for Cover Price 5.99 While Supplies Last! 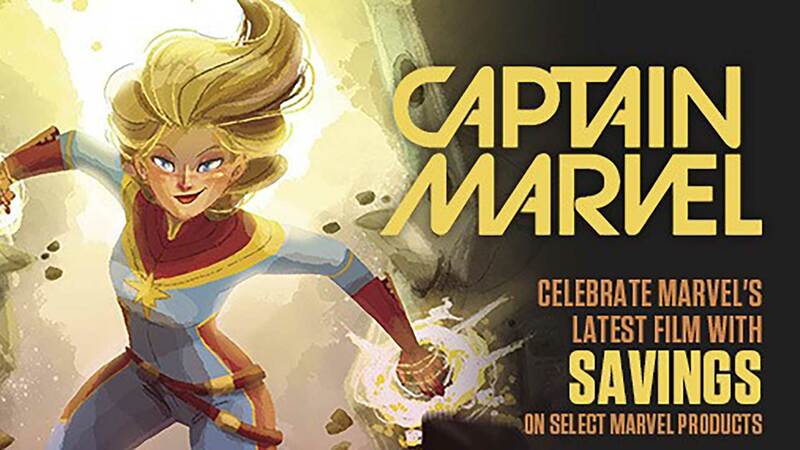 March 31, 2019: Third Eye Book Club: Captain Marvel Q&A w/ Kelly Sue DeConnick! Hey Third Eye Faithful -- CAPTAIN MARVEL has been taking the world by storm and here at Third Eye, we know that every week, more and more of you are gonna be coming in to get your Carol Danvers fix - especially after the movie comes out! We also know that you're always looking for a good reason to get together with your pals at Third Eye, and talk comics -- so, guess what? We're hosting a book club for CAPTAIN MARVEL -- and we want YOU to come and join us! On top of all that - we'll be live-streaming the whole Book Club via FACEBOOK live!!! So, even if you can't make it in person -- you can watch at facebook.com/thirdeyecomics -- but c'mon: you know we want you to be a part of our live studio audience! WHY ARE WE SO PUMPED ABOUT CAPTAIN MARVEL? Captain Marvel fever is hitting everyone hard in the best way. With the movie destined to change the course of the Marvel cinematic universe forever, there are still TONS of fans eager to learn about the origins of earth's mightiest hero. Kelly Sue DeConnick's CAPTAIN MARVEL run takes Carol Danvers from out of the Ms Marvel role and into Captain mode, and even gives her the iconic suit Brie Larson wears in the movie! What's the scoop on CAPTAIN MARVEL and why is it so darn cool? As Carol Danvers comes to a crossroads with a new life and new romance, she makes a dramatic decision that will alter the course of her life - and the entire Marvel Universe - in the months to come. But as Carol takes on a mission to return an alien girl to her homeworld, she lands in the middle of an uprising against the Galactic Alliance and the Spartax! Investigating the forced resettlement of Rocket Girl's people, Carol discovers that she has a history with the man behind the plot. But when the bad guy tries to blackmail Carol and turn the Avengers against her, it's payback time! Q&A WITH KELLY SUE DECONNICK? Captain Marvel fever is taking over in a big way - and we're so pumped that we reached out to writer KELLY SUE DECONNICK who agreed to have a Skype Q&A session with us! Not only will you be able to chat with Kelly Sue while she signs copies of her amazing titles for you all - we've got MATT FRACTION on board too! If you've had long lingering, burning questions for either amazing creator - you don't want to miss this! TORMA & STEVE GET BAKED! It's the return of world class culinary kings Torma and Steve! Not only will they be your hosts for the evening - they're back and this time they're baking cake for everyone! Now for the most important question to end all questions - what should we put on the cake? Torma's face? Or Steve's? Lan Pitts appears at Third Eye Comics on Saturday, March 30, 2019 from 11 AM till 1 PM to sign the WrestleMania 2019 Special #1 from BOOM! Studios!